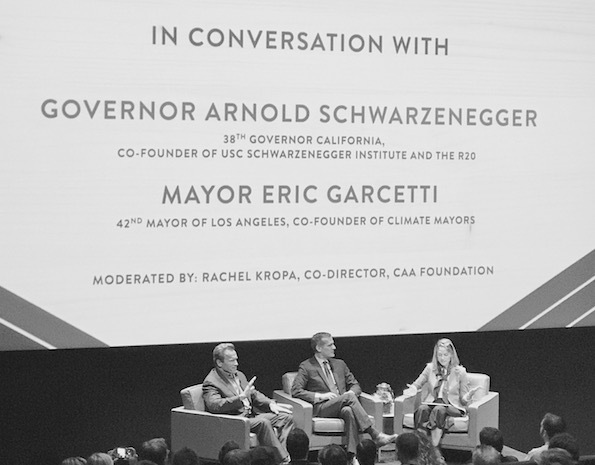 Earlier this week, A/G attended a discussion on the implications of the US withdrawal from the Paris climate accords with LA mayor Eric Garcetti and California's 38th governor, Arnold Schwarzenegger at the Creative Artists Agency (CAA). The bipartisan discussion, facilitated by Rachel Kropa, co-director of the CAA Foundation, covered a lot of ground. What are Garcetti and Schwarzenegger doing? In the words of the former governor, we are "marching to a clean and green future" and "letting the world know America is in." Schwarzenegger's Regions of Climate Action is working with subnational governments to promote sustainable development and infrastructure, and Garcetti along with 338 Climate Mayors, is working to bolster efforts to reduce greenhouse gas emissions in cities across America. What do we do with the US withdrawal from Paris? Leadership does not have to come from Washington. California leads. Los Angeles leads. We can lead. As Schwarzenegger said, "California has the strictest environmental laws, but at the same time we are number one in economic growth." Garcetti highlighted many of LA's successes including the fact that the city is home to the largest electrical vehicle fleet in the US and just last week celebrated completion of the world's most powerful rooftop solar array. In November, Measure M passed which will transform public transportation in LA. Each of us can also become sustainability champions in our own organizations and in our own personal lives. Why doesn't climate change get the proper air time in elections and debates?